While you might be aware of a rough concept of digital identity management for your business, are you actually taking the steps necessary to establish yours? These days, it seems like everyone is talking about social media. So-called gurus are sprouting up everywhere, spouting off buzz words like Web 2.0, Twitter, Facebook, Blogging… But while such talk is all the rage in Internet and marketing circles, many of the rest of us are left wondering whether this is for real.. or whether the gurus have been drinking too much kool-aid. If you’ve felt skeptical, congratulations! – you’re right. The Gurus talk about the need to pump out “content”. The more information you spew out, the more search and social attention you get. However, this trend cannot continue. As more companies wake up to this idea, they will generate more and more hollow content, until most ideas just get lost in a vast sea of information. The Gurus talk about the need to engage prospective customers on Facebook, Twitter, etc. However, again, this trend will be self-limiting. There is a limit to how many people one can legitimately follow or friend. After a certain point, the customer suffers information overload. And when they do, who are they going to follow? There is a saturation point in terms of “social” and when it arrives, less formal relationships will be the first to go. So if the social media revolution is self-limiting, does that mean it is useless? And where does that leave you? Here’s how to beat the trend and build your business. Savvy companies are already looking ahead to the next step. They are planning ahead for an age in which we all suffer from information overload and over-connectedness. In this next phase, there is a place for tools such as social media In fact, they will be a critical part of your marketing arsenal, and you will use them in ways that deliver tangible, measurable results to your bottom line. And that is where we come in. 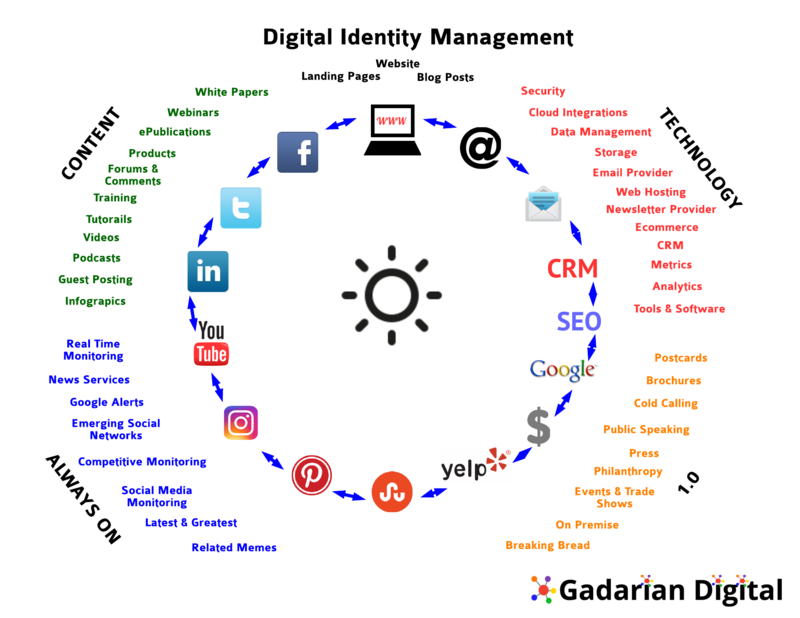 Gadarian Digital is a worlds leading authority on digital identity management… the next phase of online business in a hyper-connected world. 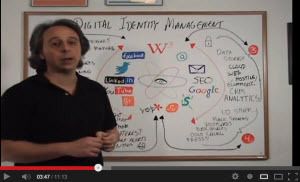 Digital identity management combines old media strategies and new media techniques to help you capture and keep attention in an information-saturated world. To control and protect your online reputation, so that prospects see you the way you want to be seen, and not the way that a few disgruntled detractors might portray you. To project a compelling, professional image through your website, your online materials, and all your electronic touch points. And yes, to engage customers and prospects through social tools, but to do so in meaningful way that creates tangible value for both parties. Drawing on more than 15-years experience with national broadcast media and internet marketing, Gadarian has helped other companies to grow revenues, strengthen their brand, and achieve a sustainable competitive advantage and we can help you too. If you would like to benefit in any of these areas, but have been skeptical about the claims of 20-year old gurus, then contact us today, for a free confidential assessment of how our digital identity management services could benefit your operation.